Please note that Indivisible Upper East Side's next monthly meeting is NEXT Thursday, March 8, from 7:30 p.m. to 9 p.m. Also, March 24 is the March for Our Lives gun-violence protest. We are looking into bus and carpool options for those who want to go to the march in D.C. , and we will coordinate a meet-up time for people who want to join a sister march in NYC. Click here to sign up for either DC or NYC. No RSVP is necessary, but a few dollars towards the pizza would be welcome! 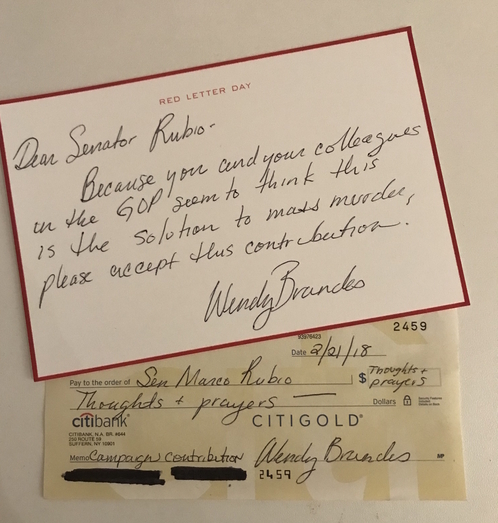 Send a worthless check to Marco Rubio; instructions are here. Share a photo of your check and note on our Facebook page. Text RESIST to 50409 to use ResistBot to contact New York senators Chuck Schumer and Kirsten Gillibrand about the Concealed Carry Reciprocity Act. This bill-- which passed the House last year and will be taken up by the Senate this year -- would force states to recognize other states’ standards governing the possession of concealed firearms in public. Schumer and Gillibrand have already condemned this NRA-backed bill, so thank them for their stance ... then ask them to hold televised town halls featuring young people speaking out about gun violence. Concerned about the local Democratic party? The rules committee will be discussing proposals to make the Manhattan Democrats more transparent, including a ban on lobbyists serving as leader. Only committee members will be able to participate. but the meeting is open to the public and may offer valuable insight into reform issues. Text RESIST to 50409 and send a message to your U.S. senators or representative, or to Governor Cuomo, about anything that's on your mind today. Anything at all! From the event's Facebook page: "If the WFP has a specialty, its field organizing: the work that goes into persuading and turning out voters. Now we want every activist to be armed with the knowledge & skills we've developed over the past 20 years of running high-level field campaigns. (In fact, our success in 2018 depends on it!)" Register here.